At over 7 feet long, the Aircraft Carrier U.S.S. FLAGG was the largest item in the G.I.Joe 3 3/4" line of toys. 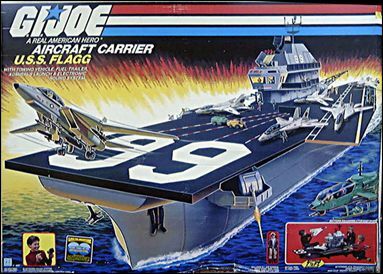 The Aircraft Carrier was named after General Lawrence Flagg, who was credited in early G.I.Joe mythology as the man who helped build the full Joe team. An electronic sound system resembling a miniature bullhorn allowed children to recreate an intercom system across the Flagg, and required one 9-volt battery. Arrestor cables and hook on the deck of the Flagg simulated the ability to stop approaching landing craft like the Skystriker jet. A working deck elevator allowed vehicles to go below deck, and a missle box swiveled on the bow to help defend the Flagg against enemy aircraft. Because of its' massive size and high price point, the Flagg was not purchased as often as the smaller vehicles. The U.S.S. Flagg came with numerous small parts and accessories, blueprints/instructions for major assembly that was required, sticker sheets for decals, and 'Admiral Keel-Haul' with filecard.